JO&JOE is a vibrant living space, a home that is open to the external world and designed to meet the expectations of Millennials and all those who value sharing, spontaneity and experience. JO&JOE rounds out the Group's economy-brand portfolio, providing a made-to-measure solution for the vast international community of Millennial-minded trend-setters revolutionizing the market. To cater to this new demand, JO&JOE aims to expand rapidly by opening 50 venues by 2020, with locations including Paris and Bordeaux (2018) as well as Warsaw, Budapest, Rio and São Paulo. JO&JOE venues will take root in bustling city-center locations that are close to public transport and less than 15 minutes away from the major points of interest. The project is an example of "excubation" led by AccorHotels' Marketing Innovation Lab, which identifies, tests and shares customer-centric and disruptive solutions that can generate additional revenue for the Group. The JO&JOE brand is the result of a co-construction process with future guests, external experts, students, the shadow executive committee and AccorHotels teams, with the overarching aim of challenging conventions and imagining the future of hospitality, catering and social interaction. “Break with tradition, forget old habits, be surprising, authentic, unexpected, bring a breath of fresh air to AccorHotels. Do it quickly and do it well. It wasn’t an easy brief to put into practice, particularly when you’re primarily targeting Millennials, who can be very difficult to win over. But with the launch of our new brand, JO&JOE, we have now more than met that challenge. I’m extremely proud of the work accomplished by the AccorHotels teams in mobilizing the energy necessary – both inside and outside the Group – to bring this enormous project to life. JO&JOE represents the very essence of hospitality: welcoming, exciting and beyond our guests’ expectations” said Sébastien Bazin, Chairman and Chief Executive Officer of AccorHotels. “More than just an accommodation solution, JO&JOE has been conceived as an experience enhancer thanks notably to its offbeat design, innovative digital ecosystem and catering offerings. With its "open house" concept, the brand diversifies the customer journey by welcoming guests as well as locals, who treat JO&JOE venues as an annex of their living room. The project is also a reflection of the Group's cultural and managerial transformation, which shapes JO&JOE's approach to hiring, management and service, another of the brand's distinctive components” added Frédéric Fontaine, Senior Vice President, Global Marketing Innovation Lab. JO&JOE is a living space, an unexpected and innovative open house welcoming both Townsters (people living nearby) and Tripsters (people in town to explore). The concept is designed to promote interaction and foster positive community living thanks to common areas that are open to both the external and internal worlds. An integral part of neighborhood life, JO&JOE always has something going on, be it a concert, a yoga class or a DIY workshop. The JO&JOE team and the Townsters and Tripsters themselves help keep the venue active and buzzing, notably thanks to the brand's geosocial application, which helps bring people together. - The bar is central to the JO&JOE social experience. Its unique design and high visibility from the street encourage local residents to join guests to enjoy a wide range of drinks, focused on a flagship product (wine, beer or cocktails), with a unique selection promoting local and craft products. - Local, affordable craft cuisine delivers quality without the frills. JO&JOE offers a range of simple and authentic restaurant concepts with a warm atmosphere: grill, open flame barbecue, wok or wood fire pizzas. - The collaborative kitchen offers guests a showcase for their culinary talents and a stage for sharing their best recipes. Guests wanting to keep their budget under control can use the space to cook meals, just for themselves or for a whole tribe. 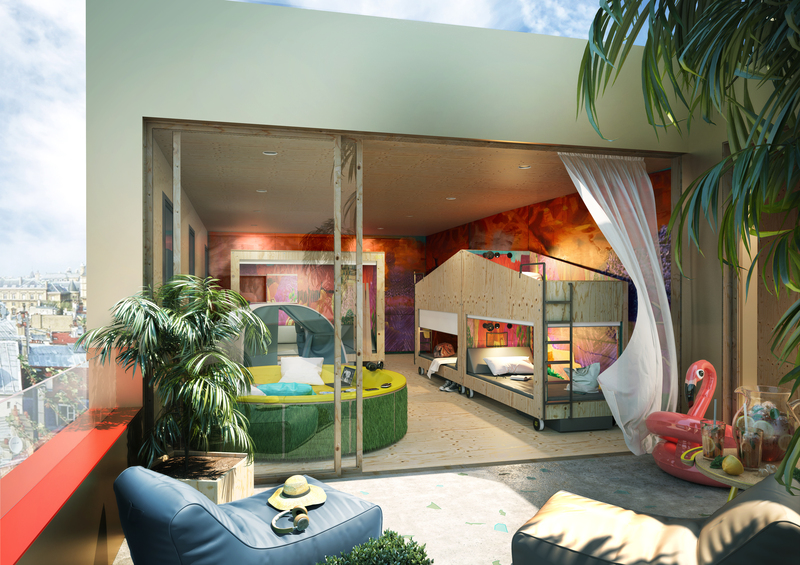 - The "Happy House" is a private area where Tripsters can relax, work, cook or wash their clothes, just like at home. - "Together", which embodies the essence of the brand, is an ingenious modular sleeping area that guests share without sacrificing privacy. In addition to spacious beds, private lockers, reading lights and USB ports, guests have access to shared recreation areas and bathrooms. - "Yours" consists of rooms and apartments for two to five people with a private bathroom and, depending on the format, a kitchen area. Ideal for small groups and families, the space offers a completely different look from a conventional hotel room thanks to originally shaped and extremely comfortable beds. - "OOO!" (Out Of the Ordinary) offers unexpected accommodation for people traveling alone or in groups of up to six people. Different at each JO&JOE venue, these original formats include yurts, hammock and caravans and ensure guests have unforgettable experience. To understand the expectations of future guests, enhance the user experience (UX) and lay the foundations of the JO&JOE community, the Marketing Innovation Lab worked with teachers and students from the Webschool Factory, a Paris-based management school specializing in design, marketing and digital technology. A unique and experiential community application was designed by a network of internal and external experts to help forge links between Townsters, Tripsters and the JO&JOE team. A veritable digital experience enhancer, it enables Townsters and Tripsters to connect, meet, initiate events, share tips, or arrange to get together for a meal or a walk. All these features are "social accelerators" that will become references in this area. "A well-designed space is the secret to a happy and satisfying life – life is too short to spend time in sad or inefficient surroundings." Lee Penson, JO&JOE designer. At JO&JOE, the only boundaries are those of the imagination. The brand wanted to break with the conventional vertical distribution of spaces and functions and instead takes a liberated, flexible and rebellious approach to meet the expectations of its guests. JO&JOE's disruptive design was co-constructed with UK design company Penson, known for creating intelligent and aesthetic spaces for the world's most visionary brands. Flagship designs include campuses for Google, YouTube, Jaguar Land Rover, Playstation, Jay Z's ROCnation and interiors of the world's 5th tallest building, Lotte World Tower. Having never worked on a hotel before, Penson delivered a decisively innovative and singular response that breaks away from industry norms. Beyond its design reality, JO&JOE is also a strong and distinctive brand identity fashioned by advertising W, a territory designing agency. It doesn't matter whether Jo is a girl and Joe is a guy – or the other way around. The name can be read any way because JO&JOE is an open house that blends genres. There is no right or wrong way to read the logo either: a dot as yellow as the sun – alive, radiant, variable shapes, multiple styles – the brand regenerates and nourishes itself with local culture and vibes. The hearts of cities around the world – places made for moving, chilling and exploring – are ideal settings for JO&JOE to deploy its resolute character and offbeat atmosphere.